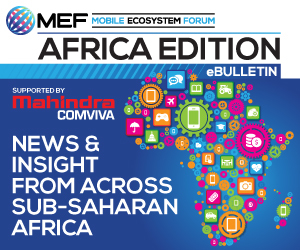 Supported by Mahindra Comviva, the regional eBulletin delivers unparalleled insight into the African mobile ecosystem and the the opportunity for mobile growth and innovation, with news and market data from across the continent. 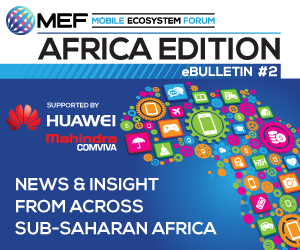 Filled with insights, interviews and opinion from industry experts, the regional spotlight will help to understand how the pan-African mobile ecosystem is taking shape across 54 countries united by an entrepreneurial spirit and an insatiable mobile-first appetite. 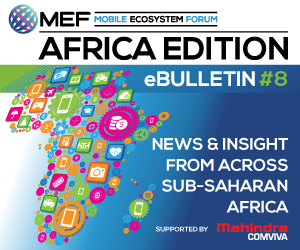 Will NFC have an impact in the African mobile payments space? : Srinivas Nidugondi, Head of Mobile Financial Solutions at Mahindra Comviva takes a detailed look at the barriers and enablers. Internet services + smartphone take-up: Karim Yaici, lead analyst at Analysys Mason’s Middle East and Africa regional research programme, examines how demand for internet services is driving smartphone adoption. South Africa has moved beyond SMS. And so should you – Country Manager at MEF Member CM Telecom James Bayhack looks at messaging apps and the future role of mobile broadband in stimulating innovation. A guide to doing business in Nigeria – Programmes and Initiatives Manager, Miranda Smith, provides an overview from MEF’s market guide to doing business in Nigeria. 15 stats that outline the market drivers in Africa – get the data behind the headlines that indicate some of the key market drivers across the continent.